On October 11, 2018, thirteen undergraduate students from University of Brasilia visited Instituto Biorregional do Cerrado (IBC) for a day of activities. 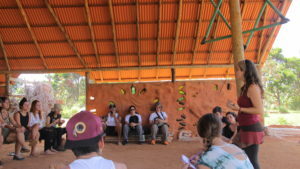 The students are attending “Interdisciplinary Studies of Cerrado” and came from varied courses: biology, economy, psychology, environmental sciences, and chemistry, among others. They were all very excited with the experience. 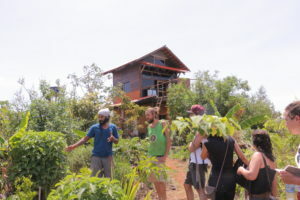 It was the first time they visited an ecovillage. 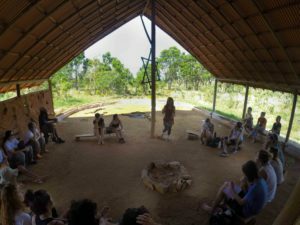 In the morning, they learned a little about the concept of ecovillages, the sustainable, community and spiritual practices we develop, and about IBC’s history. 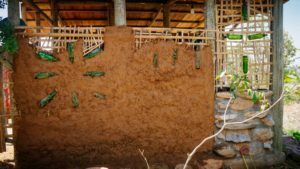 Afterwards, they participated in hands-on workshops to practice natural construction and planting techniques. The workshops ran until midday, when a delicious vegetarian meal was served. After lunch, the students participated in an activity using the GEN Ecovillage Design Cards (which were translated for Portuguese last year for the ECCO Conference), in which they discussed many economic, social, cultural and ecological issues of contemporary lifestyles. They were encouraged to see the cards as an oracle and to think about how they could apply the cards’ principle in their own lives. It was very exciting to listen to the students’ conscious and critical thoughts. Afterwards, we did a more playful practice to experience a wider sense of time – what Joanna Macy and Molly Brown call “deep time”. The idea is to abandon the fragmented experience of time we live in contemporary society, with its overwhelming pace of consumption and technical innovations which disconnect people from their ancestral heritage and from future generations. The deep time practice helps us reconnect to a wider experience of time, tuned to longer ecological rhythms and connected to past and future beings. We learn to act as ancestors of future generations and, as such, we take responsibility for the legacy we are going to leave on Earth. It was beautiful to see the students’ and teachers’ surrender to the practice. In the feedback circle, we were moved by the intensity of the experience. Certainly, many of the students left IBC with a new perspective on life and with the hope that even in dark times (we are facing a particularly dark political time), there are people working for the Great Turning. 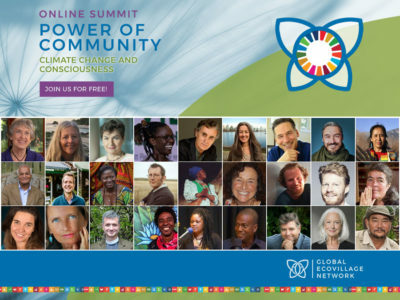 I believe that the most rewarding work is to show to young people that there are alternatives and that they can be a part of this movement for a more sustainable, collaborative and just world.